When I first told you I had gotten a Fisheye lens as a present, I mentioned when the subject called for it, I would use the Sigma 15mm f/2.8 EX DG Fisheye Lens. Oh, but the Fisheye is a crafty seductress. Once I do put the Fisheye lens on my camera, I find all sorts of subjects to photograph with it. For instance, I never thought of it as a lens for landscape photography. 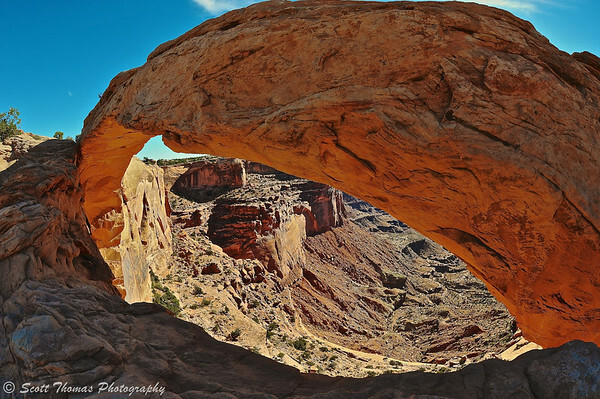 The Mesa Arch in Canyonlands National Park in Utah is large and hard to get all in one frame except from a distance. With the Fisheye, I was able to get in close (within 5 feet) and accent the arch’s curvature. 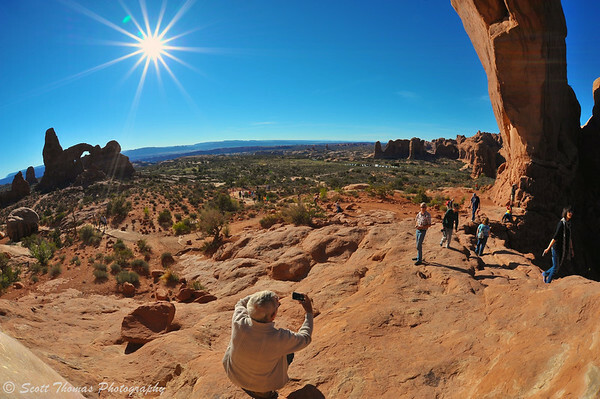 I found it was fun to shoot into the Sun using a Fisheye stopped down to f/22 like you see here of Turret Arch in Arches National Park near Moab, Utah. Turret Arch sunburst from North Window Arch in Arches National Park near Moab, Utah. Nikon D700/Sigma 15mm, 1/125s, f/22, ISO 200, EV 0. The real reason I wanted a Fisheye lens was for the Disney themeparks. 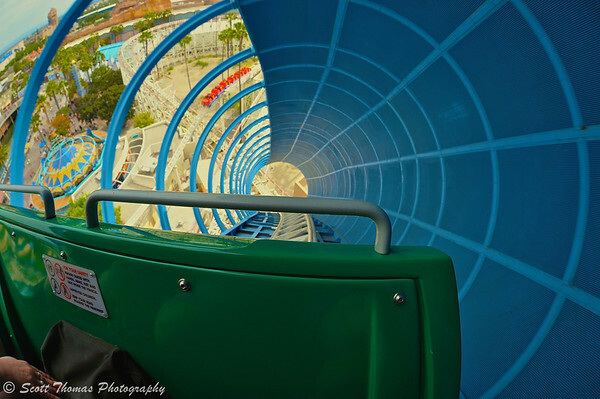 For years I have seen other photographers share wonderful photos with their Fisheye lenses. I got my own chance the last couple of months. First at Disney’s California Adventure in Anaheim, California. Riding the California Screamin roller coaster at Disney’s California Adventure in Anaheim, California. Nikon D700/Sigma 15mm, 1/250s, f/8, ISO 200, EV 0. 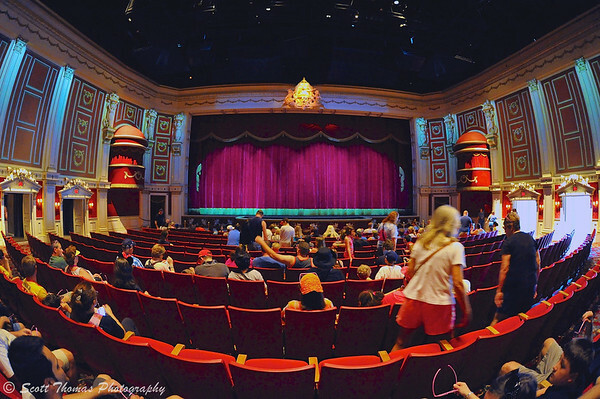 Guests take their seats in the Muppet Vision 3-D theater before a performance in Disney’s Hollywood Studios at Walt Disney World, Orlando, Florida. Nikon D700/Sigma 15mm, 1/25s, f/2.8, ISO 6400, EV 0. This entry was posted in Photography and tagged arches national park, california, california screamin, canyonlands national park, disney's california adventure, disney's hollywood studios, fisheye, guests, landscape, mesa arch, moab, muppetvision 3-d, nikon D700, rock, roller coaster, sigma 15mm, sun, sunburst, theater, turret arch, utah, walt disney world. Bookmark the permalink.